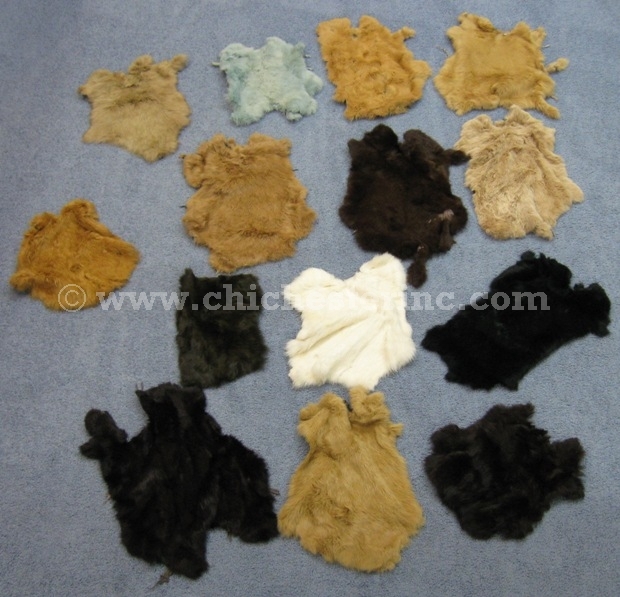 We offer cut-up grade dyed rabbit skins in a few colors as shown above. These are not skins we regularly stock, so once these are gone, we do not know when we will have more. The Cut-Up Grade Rabbit Skins are lower quality skins that have good fur, but have serious cosmetic defects. For example, these skins can be smaller than normal, misshapen, have extensive tears, holes or bald spots in the middle of the skin or have patches of bad hair on them. They are unsuitable for resale as novelty skins to tourists or kids, but are ideal for cutting up into smaller pieces for craft projects or for testing clippers. We use this grade of skin to make many of our rabbit fur bags and for trim on crafts. These are good value for the money if you need good fur and can work around the problems. These rabbit skins are chrome tanned. NOTE: We have mostly black, brown, and gray left in stock. We recently got in some fluorescent red and fluorescent fuchsia that are unevenly dyed (see pictures below). Please note that the dyed rabbits do have a chemical odor as a result of being dyed. They may also have a mothball odor as well because we have to prevent bugs from getting into the skins. You can reduce this odor by either airing them out or by tumbling the skins in a dryer with a dryer sheet on very low heat for no more than five minutes. Any more than this will shrink the rabbit skins and you will no longer have the option to return them if unsatisfied. If you're worried that the rabbits skins may leave an odor in your dryer, we suggest you use a public laundromat. For more information on our rabbit skins, please click HERE for the main rabbit section. For more dyed rabbits, click HERE. Genus and species: Oryctolagus cuniculus. Video of cut-up dyed fuchsia rabbit skins. Video of cut-up dyed red rabbit skins.